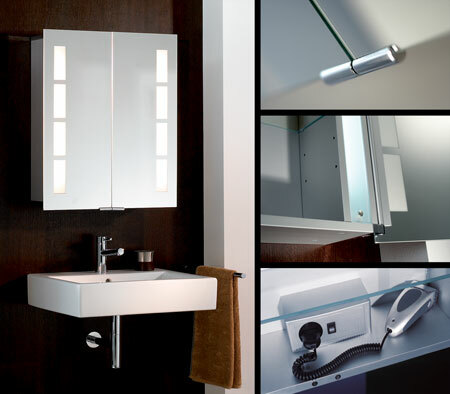 The Tracks illuminated bathroom cabinet is manufactured in high quality aluminium to give quality and longevity. Each bathroom wall cabinet has double sided mirror doors, hidden door hinges and 3 adjustable glass shelves to suit individual bathroom storage requirements. The Tracks bathroom cabinet range is manufactured in Germany and is covered by a manufacturers lifetime guarantee. Within this range of aluminium bathroom wall cabinets we can supply single door bathroom cabinets, double door bathroom cabinets and large three door bathroom cabinets, all supplied with lights and shaving socket. * With lights & shaving socket.